We’ve all been there – ads on every website shouting “AMAZING SALES!! !” And you immediately go “omg I need to buy it alllll!!”. People, we do not want tears on the lead up to Christmas because you have no monies to buy gifts, so follow my rules when navigating those enticing sales and live to shop another day! 1.) Have You Done Your Research? Looking into the brands you love ahead of time and making a note of what you want is the way to go, so there’s no derailing on the day! Also, make sure you’re aware of what the brands highest sale % has been in the past, if you’re waiting for 70% off, that may just not happen and you’ll miss out on the item you want because you waited for a % that was never going to come. 2.) Is It Top Quality? Go into the items description, what fabrics are being used? This will usually give you a much better insight as to whether the piece will wear well and whether you’ll get a good amount of time with said item prior to it falling asunder! Don’t fall down that rabbit hole Alice, you DO NOT want to buy the wrong size just because it’s sold out in yours. It’ll either sit in your wardrobe forever untouched OR you’ll be faced with the heartbreaking palava that is, returning items over the busy holiday period. 4.) What Is The Return Policy? Check out what theirs is, it will differ with each and every site and brand, so do make sure you know what your options are before you pay. 5.) Do You Need It? I’m not saying you shouldn’t ever buy something you just want – I’ve definitely done that – but more often than not, I’ve actually needed the piece as well (SURE I could’ve bought a cheaper version of it somewhere else, but I didn’t want to – see what I mean?). If you need a new pair of tailored trousers, pull the trigger – if you already have 5 pairs hanging in your wardrobe, perhaps look into getting a different colour, or a pencil skirt instead. 6.) 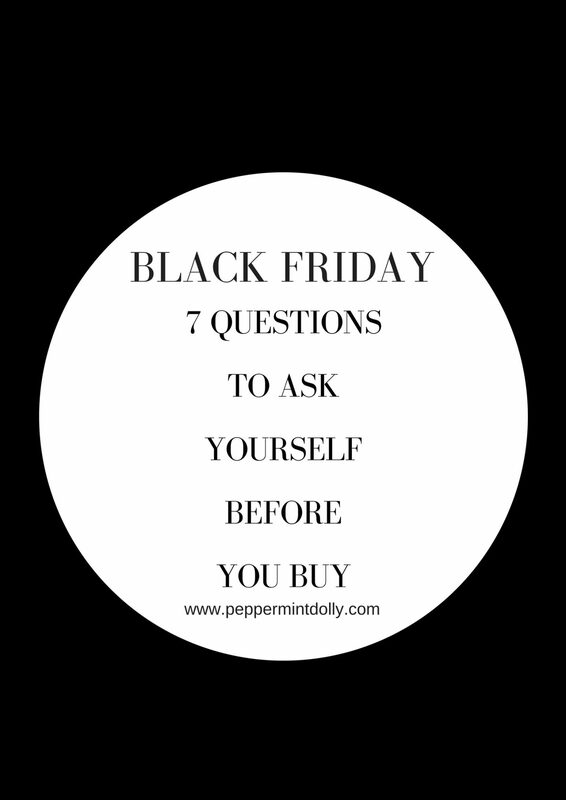 Are You Wearing Black Friday Goggles? Face it, the shopping frenzy of Black Friday is easy to get swept up in. So take a BREATH and remember, the urgency you feel has been created by HUGE companies who have incredible marketing and pr teams that have spent MONTHS figuring out how to get you to buy – they want you to buy – they want you to feel like EVERYTHING is selling out so that you impulse buy because “omg it’ll be snapped up by that woman on the opposite side of the world – I can’t let her have it – it’s mine!!!”. Take the goggles off, de-Gollum yourself and just be a grown up for a second, do you actually want this, or have you succumbed to the hype? 7.) Do You LOVE It? This is the big one because if you cannot answer a big emphatic YES at the time of purchasing, you really shouldn’t be buying it. Don’t get suckered in by sale prices, just because it’s a great deal does not make it a great piece for YOU. Know what you need and what you love and stick with those rather than getting distracted when it comes to actually buying some goodies. If you LOVE it, then you’ll love it when you get it which means you will wear it/use it. Answer truthfully to all of the above and if the answers are the right ones then – YOU GO GLEN-CO-CO! These are good questions. I feel like a lot of black Friday stuff is impulse but if you really think about it you can narrow it down to what you really need. Having a list is a great idea!